School Lunchtime Struggles…. How we survived! School lunches were a big struggle for me. A big factor is my kids are only given 25 minutes to eat. 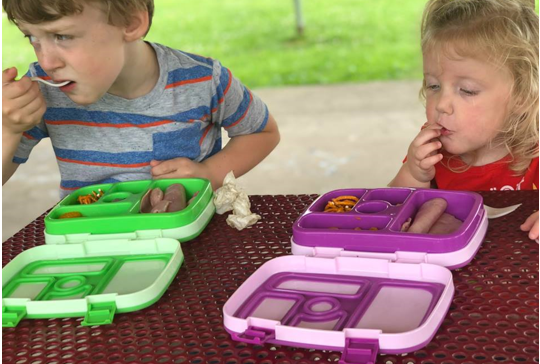 Because of the tight time constraints, hot lunch was not a good fit for them, by the time they got their food and sat down, they only had a few minutes to eat! We decided our best option would be having them take their own lunches, but that lead to a whole new challenge seeing as they are picky eaters! 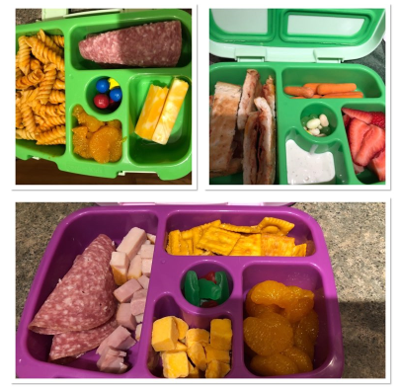 The time it takes to prep, disagreements on what to put in, getting a good balance of nutrition, but including ‘good tasting’ things, and having a rotating variety made it a constant battle in our house. The meal has to be immediately appealing and easy to eat. After trial and error during the first month of Kindergarten, we finally hit our groove and learned what works best for us. I REFUSED to pay the price of “Lunchables” so what I did was order a few Bentgo Boxes for personalized compartment lunches. This did the trick and helped Nolan actually eat his entire lunch. I do mix it up and send sandwiches and wraps, too. I have compiled a list of some of my lunch box fillers! These have really worked for us, plus Nolan can help pack his lunch and encourages a variety of food! We do repeat the fruits often. He really loves mandarin oranges, but I try and give fresh fruit whenever possible. I also include a frozen Gogurt tube or Danimal and a drink most days. For taking to school, Nolan uses an insulated style lunch bag. I pack the Bentgo with an ice pack, silverware, and his drink. It stays cool and they DO NOT LEAK or mix together! The Bengto I use has a small center compartment and I usually put a small dessert/treat in for him. Jelly Beans, Swedish Fish, Gummies, M & M’s are a few of the things I drop in. If you are looking to grab one of these Bentgo Boxes you can get them from Zulily on sale thur 3/19. Tortilla with ham & pickle, cheese curds, animal crackers, raisins, pineapples.